Members of Congress and others have raised concerns about the high prices of certain drugs and the impact these high prices have on Medicare beneficiaries and the health care system. An important part of the Medicare Part D benefit is catastrophic coverage, which beneficiaries enter when their out-of-pocket costs exceed a certain threshold. In catastrophic coverage, most beneficiaries pay a 5-percent coinsurance for drugs, while the Federal Government pays the vast majority of the remaining costs. Understanding the effect that high drug prices have on spending in catastrophic coverage is crucial. In catastrophic coverage, beneficiaries' out-of-pocket costs are not capped, and the Federal Government's share of drug spending is the highest. We analyzed data from the Centers for Medicare & Medicaid Services to determine the amount that the Federal Government spent for catastrophic coverage through the reinsurance subsidy. We also analyzed the Part D Prescription Drug Event records to identify specific drugs dispensed in catastrophic coverage. 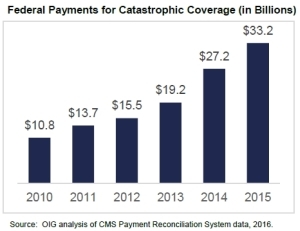 Federal payments for catastrophic coverage exceeded $33 billion in 2015, which is more than triple the amount paid in 2010. Spending for high-price drugs contributed significantly to this growth. By 2015, high-price drugs were responsible for almost two-thirds of the total drug spending in catastrophic coverage. This is a significant increase from 2010, when high-price drugs were responsible for one-third of the spending. Moreover, 10 high-price drugs accounted for nearly one-third of all drug spending for catastrophic coverage in 2015. Most of these drugs cost thousands of dollars per month. They treat conditions such as hepatitis C, cancer, and multiple sclerosis. The average prices for each of these drugs ranged from $1,200 to almost $34,000 per month, leading to high out-of-pocket costs for some beneficiaries in catastrophic coverage. The dramatic growth in Federal payments for catastrophic coverage and the underlying issue of high drug prices must be analyzed and addressed to secure the future of the Part D program. The issue of high-price drugs is not exclusive to catastrophic coverage; it affects the entire Part D benefit and can lead to higher costs for all beneficiaries. Securing the future of the Part D program while ensuring beneficiaries have access to needed drugs is a complex issue that calls for a multifaceted approach. OIG remains committed to examining these issues. Recently, CMS has taken steps in response to rising drug prices. It published information about certain drugs with substantial increases in price. CMS also stated that action is necessary to address rising drug costs and asked the industry to partner with the agency to find solutions that allow for both innovation and affordability. Moving forward, CMS will likely need additional tools to address these issues. Potential tools have been discussed by experts and include restructuring the Part D benefit so that sponsors have more incentives and opportunities to lower costs, creating more transparency about drug pricing, promoting value-based options, and revising the law to allow the Federal Government to negotiate prices for certain drugs. CMS should carefully assess these and other options and should, working with Congress, make any needed changes to the Part D program.